Twelve DPA members and friends gathered at the Yellowmeade track quarry car park on Saturday 25th November, also across the road by the old Mission Hall, by the Pump House and one car at Four Winds, where they were taxied to the start of the 11th DPA Short Walk. 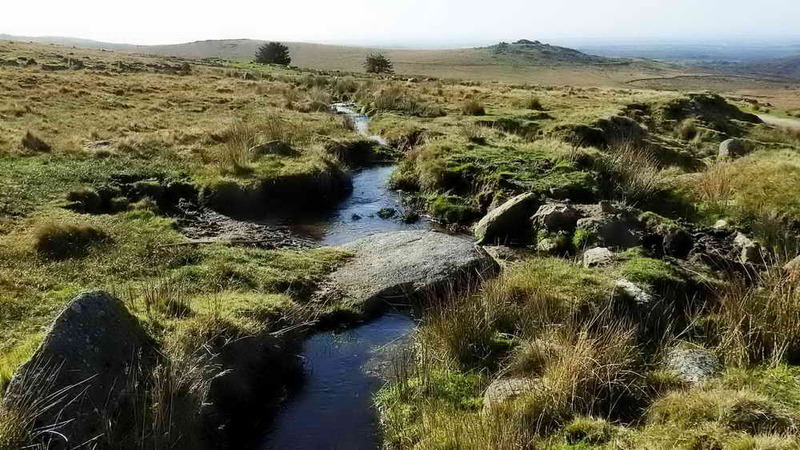 We set off up the hill, crossing the leat from Mistor Marsh that supplied Red Cottages, Yellowmeade and Foggintor. The two trees in the photograph below are at Red Cottages (more about them at the end of the walk). The first objective was Hill 60 Quarry (photograph below). There is some question about when the quarries in this area opened and closed. 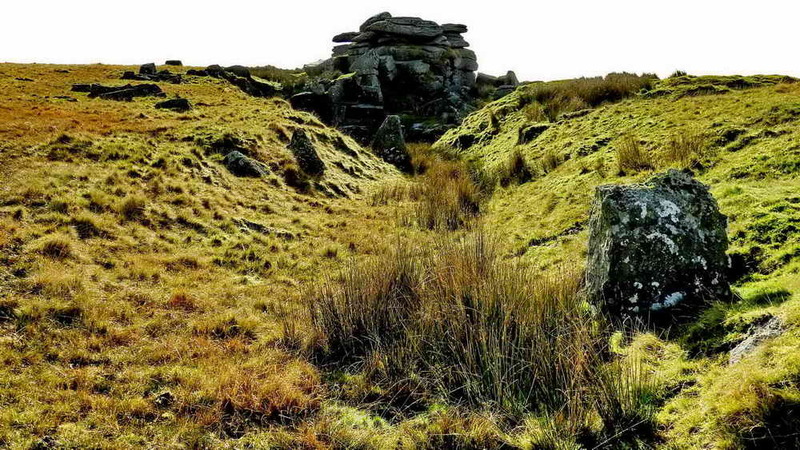 Kath Brewer (1998), The Railways, Quarries and Cottages of Foggintor. Orchard Publications, Newton Abbot, page 73. says “in 1936 Hill 60 (Hollow Tor) Quarry was opened” (by thee named individuals), querying if the quarry was opened in 1919 at Hollow Tor and wondering where these three individuals went until 1936 when Hollow Tor was reopened? It is not said when Hollow Tor Quarry (the next objective) originally opened or closed. If anyone wants to research these details, they should consult the Maristow estate ledgers kept by George Giles and now held by the Plymouth & West Devon Records Office in Plymouth (Mike Brown, pers. comm.). He adds “I fear that it would be a painstakingly thankless task trying to find any direct references to the sites. Any takers? 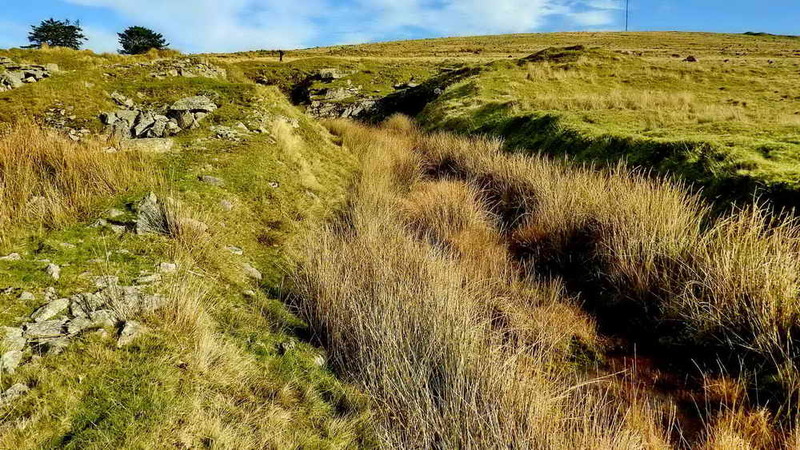 There is mention of a Billy’s Tor in this area (Hemery, High Dartmoor, page 1027) but the area seems to be bereft of a tor where it is suggested – it is possible that “Hill 60” was in fact the site of the tor because this quarry was opened by Billy Easterbrook and two others. Hill 60 was a feature in the Battle of Ypres in WW1 and perhaps it was opened just after that event, it has been suggested that it was worked by survivors of “Hill 60”? 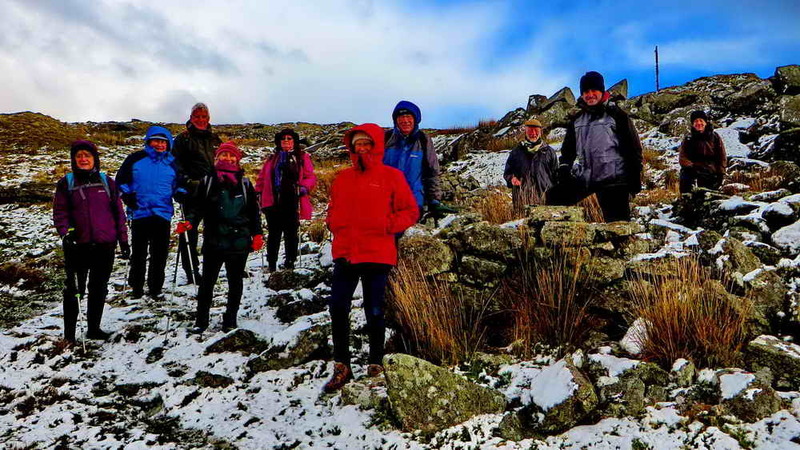 After Hill 60 Quarry, we walked up the slope to Hollow Tor Quarry. This is another fairly small quarry but without a picturesque lake i.e. it is not flooded. 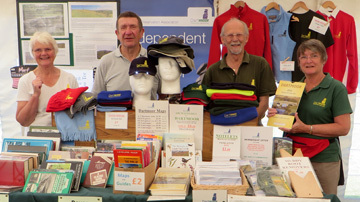 The photograph below shows the entrance ….. 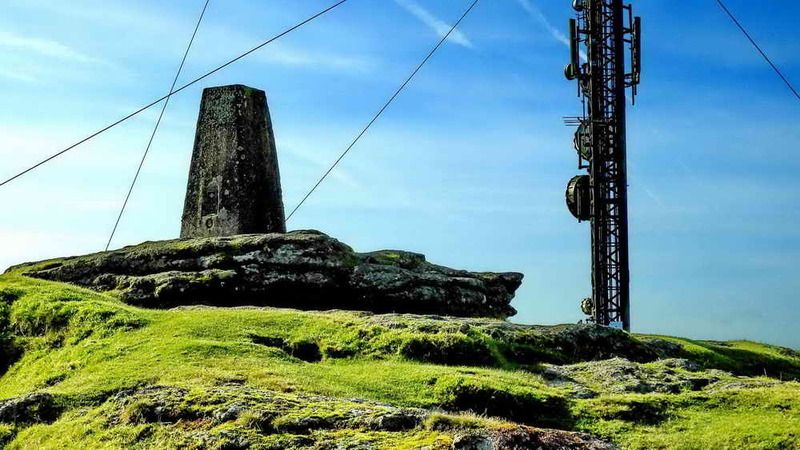 Hollow Tor has a gap in the rock structure when seen from the west side …..
After moving on up the slope, there are views of the North Hessary Tor TV transmitter on the top of the hill …..
Before reaching the transmitter, one can divert to Rundlestone Tor, which was not undertaken on this walk. 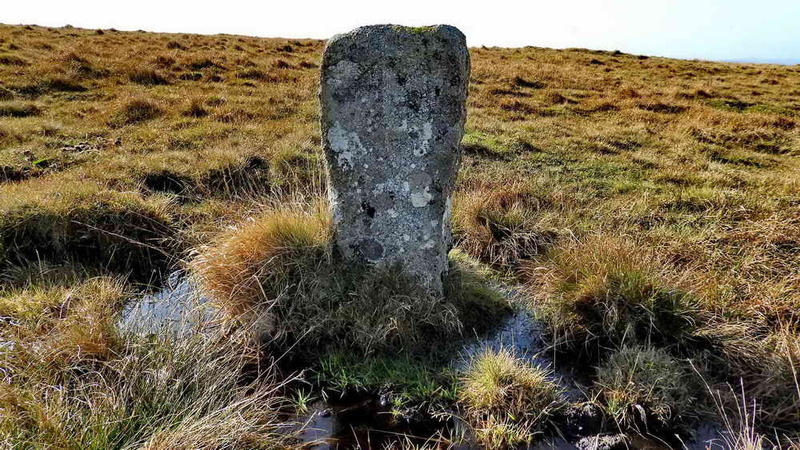 Instead, we headed straight for one of the original boundary stones of the land granted to the prison at Princetown ….. The old prison marker stones were probably erected around 1806 when the prison was being built, with 360 acres of land. They are marked with a plain incised arrow arrowhead. 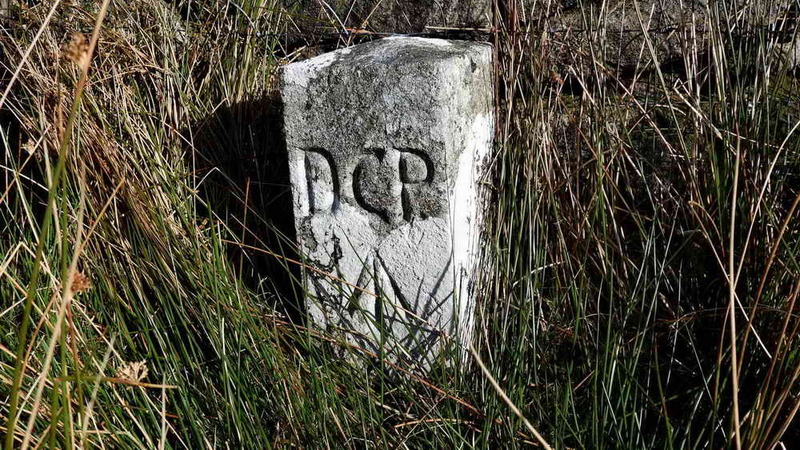 In 1867, the prison was granted another 1,000 acres of land and the “new” DCP marker stones were put in place. DCP signifies the Directors of Convict Prisons, these were to oversee the running of land prisons when the practise of housing prisoners in old wooden ship hulks and the practise of transporting prisoners to Australia were brought to an end. 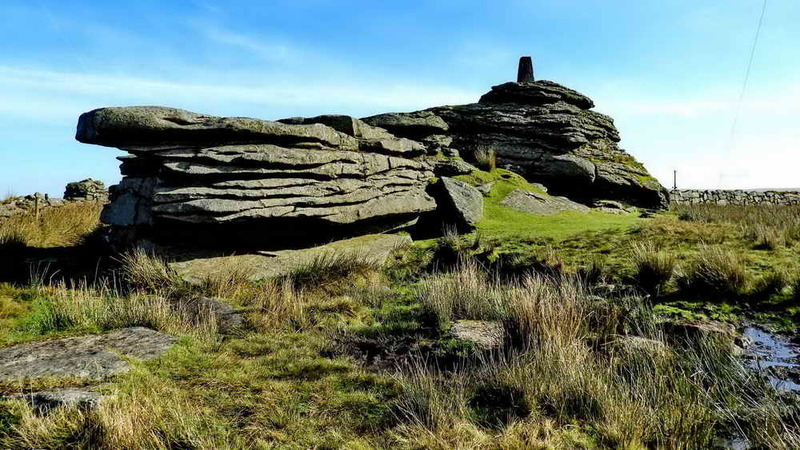 There is a triangulation pillar on the summit of North Hessary Tor (elevation 517 metres/1696 feet). These date from the Ordnance Survey’s retriangulation of Britain which started with the completion of the first pillar on 18th April 1936. This updated the original Principal Triangulation of Great Britain, 1791-1853. Also, see Benchmarks. 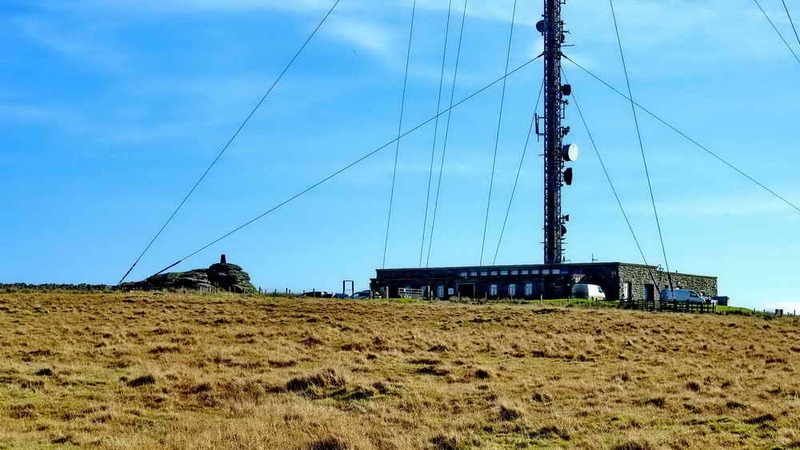 It is not easy to see North Hessary Tor properly – you have to get between it and the transmitter station ….. we hid around the back of the tor out of the wind for our short coffee stop ….. 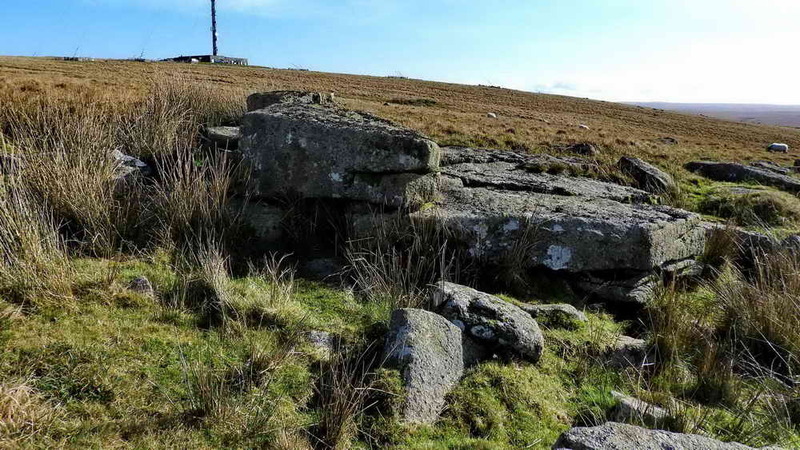 There is a rare PCWW 1917 (Plymouth Corporation Water Works) mark that is not a granite pillar but is on the base of the tor that marks the edge of the water catchment area for the Burrator reservoir. 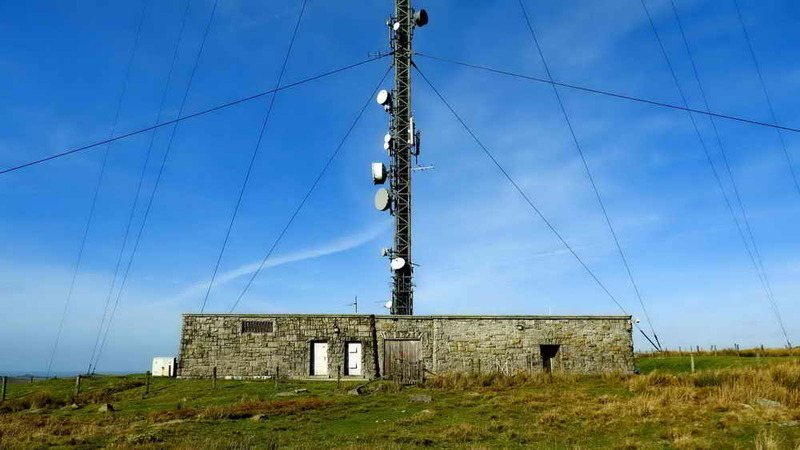 The transmitter station has a guyed 196 metres (643 feet) high mast that actually transmits very little television. It carries a number of radio, telephone and other communications devices. 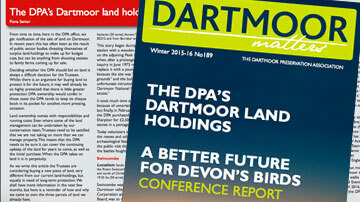 See also Caradon Hill and Plympton transmitters. As can be seen from the photograph, it snowed! 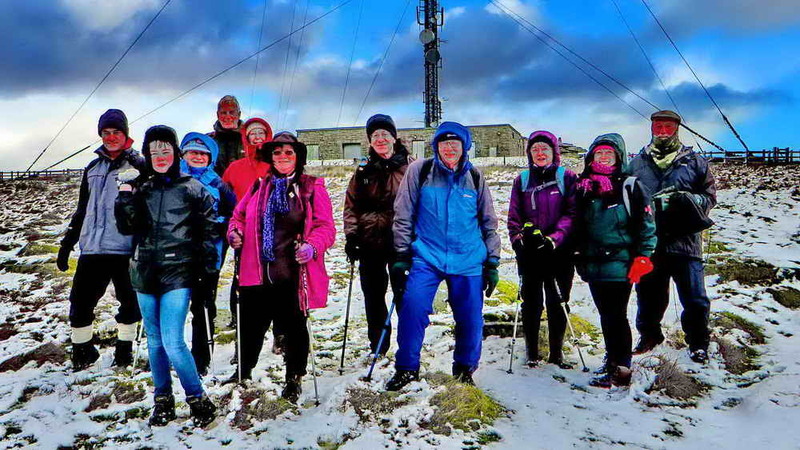 The rest of the photographs were taken on sunny reconnaissance walks. 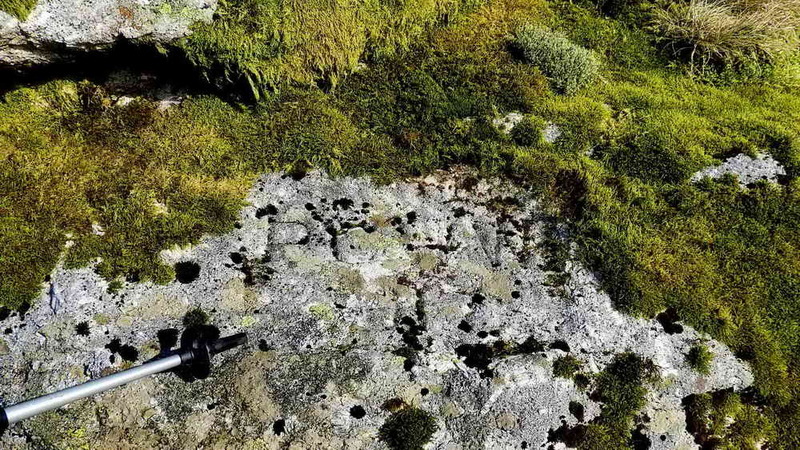 This little rocky outcrop has a history! The topmost slab, facing the camera, still bears the word “TOR”. 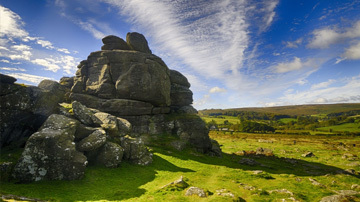 It appears that the Duchy had disputes with neighbouring landowners in the early 18th to mid-19 centuries and the “TOR” rock suggests that they were trying to extend their boundary to this location. The name i.e. letters preceding “TOR” have been professionally chiselled away, having been N. Hisworthy or N. Hessary. This mark was on a straight line section of Forest of Dartmoor boundary, as shown on a map produced for a booklet by Sir Thomas Tyrwhitt. The next stopping point on the walk, apart from those to admire the extensive views, was a small quarry I am calling “Uncle Albert’s Quarry”. It is the least impressive of the four quarries visited today. 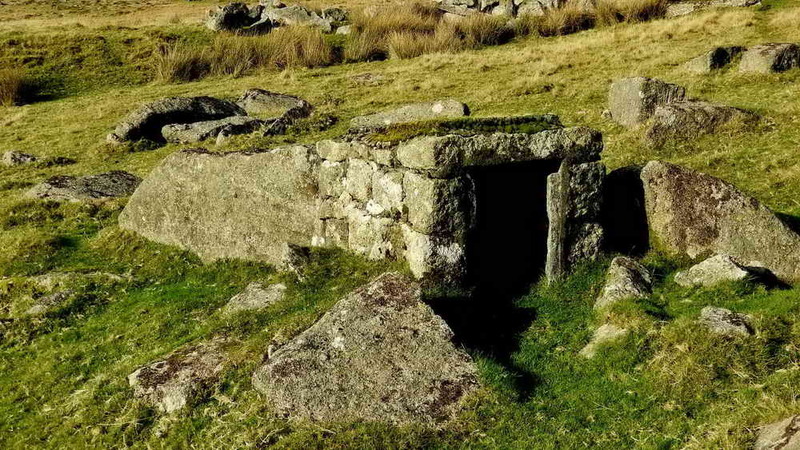 It is located about 270 metres up the slope from Yellowmeade Farm and is notable for the ruins in the entrance area of what is described by Hemery (page 1027) as “Albert Cole’s granite shed”. After passing through a Bronze Age enclosure with three scattered hut circles built against the enclosing wall, we came to the explosives store at West Mead Quarry. 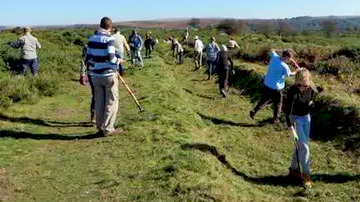 The following two photographs are of features that were planned into the walk but were bypassed due to the weather and time constraints – we moved straight to Red Cottages. West Mead Quarry with the trees at Red Cottages behind. This was leased by uncles and then cousins of Kath Brewer from 1941 until it closed in 1966. Source: (Kath Brewer (1997), The Railways, Quarries and Cottages of Foggintor, Orchard Publications, Chudleigh, Newton Abbot, page 73). 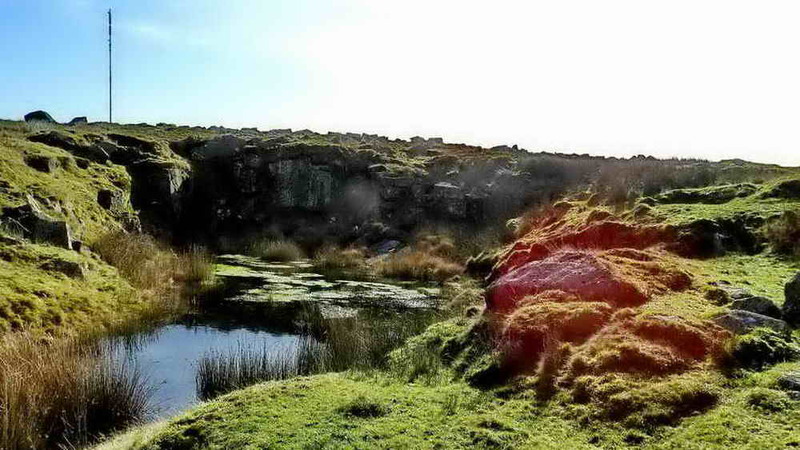 The quarry had its own blacksmith’s building, a little of which appears on the near left in the photograph above ….. 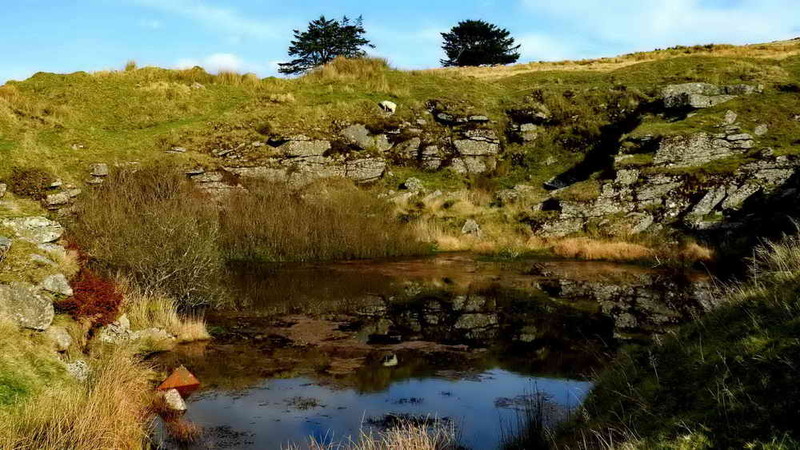 The photographs for this walk were taken on sunny reconnaissance walks before today and the opportunity to show the reflections in the flooded quarry could not be overlooked! Red Cottages were built around 1847, with plans dating from 1846 (Kath Brewer, pages 94-95). Originally, they were West View Cottages. There were 6 plots with 12 dwellings. 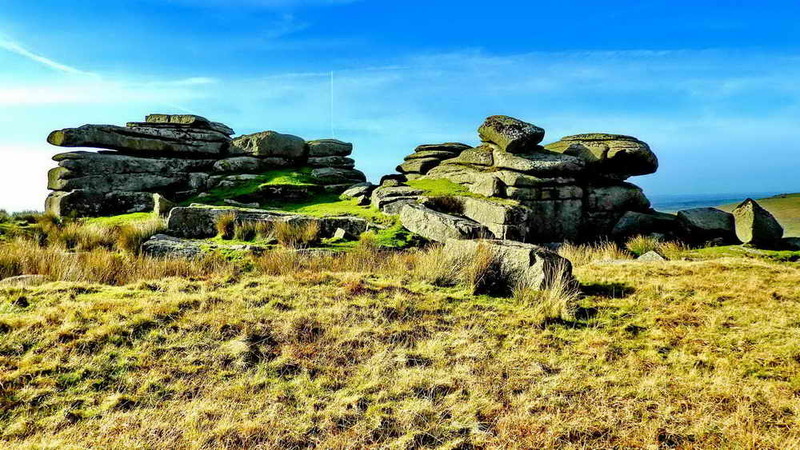 In the 1861 Census, there were 50 adults and 38 children living here – 88 souls, which reflects the importance of quarrying in the area, with Foggintor, Swelltor, Little and Great King Tor and Criptor quarries along the track. In the 1830s-1840s, quarrying provided work in the area for up to 600 men. 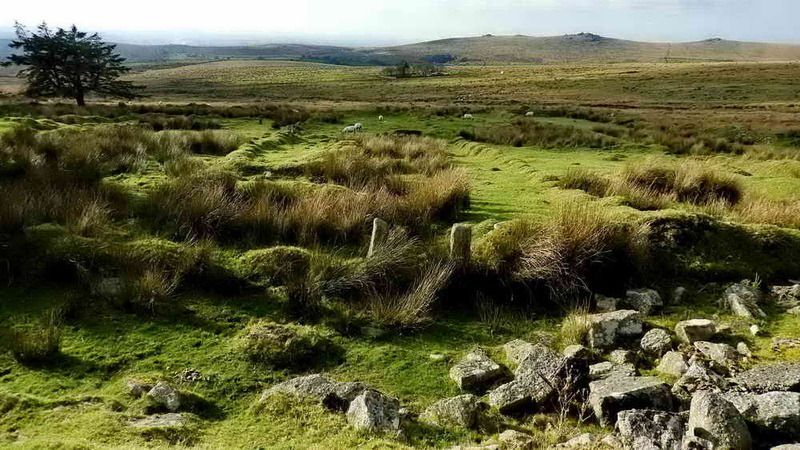 Source: Stephen Woods (1988), Dartmoor Stone, Devon Books, Exeter, page 283. The cottages were built of cob but by 1871 the weather got into them so badly that they were “covered with corrugated iron” and painted with red lead, thus becoming known as Red Cottages – this name appears in the 1871 Census. Kath Brewer writes that in later years they were actually black, having been covered with pitch , again against the weather. From Red Cottages, it was only about 200 metres back to the car park.